Come visit the beautiful, ocean side city of Victoria, British Columbia. This accommodation is completely self-contained, is impeccably clean and very tastefully furnished. 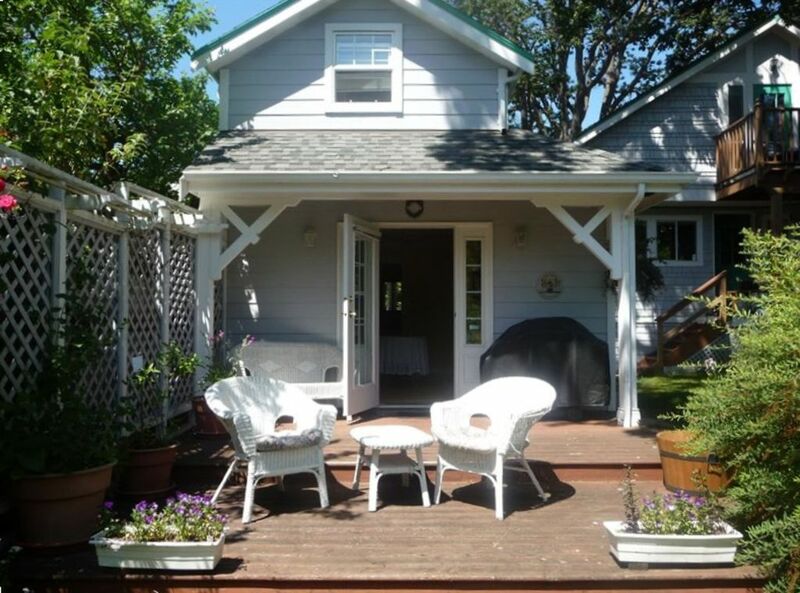 Enjoy your own patio in a fenced, private backyard just a 20 minute walk to downtown Victoria. People love the quiet and safe neighbourhood, just a block away from Fernwood Village that boasts tapa bars, a heritage pub/restaurant, a kosher grocery store and a lively coffee shop. The suite is ideal for a couple or a small family. Kids are very welcome! My wife and I stayed at Maggi's quaint little cottage in the heart of Victoria. Close to everything. The accommodation was lovely, the bed was comfortable, and the location beautiful, with our own private garden and visiting cats. Maggi and her son made us feel quite welcome on our arrival and made sure to know that if we needed anything just let her know. I would definitely stay there again on a return trip to Victoria. Great stay. It reminds me of a cute rustic cottage from out in Ontario. Beautiful yard partially fenced, a 2 foot stone wall takes over and separates the yards, complete privacy and the yard as a whole has is completely closed off and is gated. Yards complete with chairs and barbeque. Maggie has 3 cats which seem to stay away. I saw the one cat who ran off when I tried to pet him. It was a nice perk to open the 2 windows on the second floor attic at night, to be able to hear the birds in the morning. There is a small standup fan for use too. Lots of extra pillows which was a plus for me. The bed seems to be an extra long double, which is nice for us tall people. Completely quite unit. (Was a nice change from the last VRBO we stayed on right on the very noisy Fort street.) Maggie's unit was completely and wonderfully quite. Maggie gave us our privacy. She knocked on our door day of checkout to see how our stay went. She mentioned she kept missing us, as we were in and out alot. Very nice lady. We would definitly stay here again. Very comfortable and convenient location! I very much enjoyed my 4 night stay in this little cottage. Maggi was very welcoming and if I needed anything she was available. I walked to a fabulous tapas bar for dinner one night, walked downtown the next night and taxied home for $10. The kitchen had everything I needed, hot water was plentiful and the bedroom is cozy. One thing to note, the backyard is not completely enclosed so I had to keep my dog on her leash and the bathroom could use better lighting. But other than that, it was a perfect stay! The suite was clean and had almost everything you need for making your own meals. Bedroom is upstairs which is a bit inconvenient for folks our age ;). The BBQ is need if repair or replacement and the toaster oven could use an update as well. Location in the Fernwood neighbourhood is convenient for most places you want to go in Victoria. WiFi was hard to connect to and a bit slow, but usable. Maggi was very nice and certainly respected our privacy. Quiet,great location and pet friendly! We were very happy staying at this property in Victoria. We were able to check in as soon as we arrived in Victoria in the morning rather than after 3pm like most hotels. The cottage has everything you need for your stay and was very comfortable for 2 adults and 1 small dog. The deck and yard make this cottage seem like your own place. Maggie is a great host and even though she lives right next to the cottage you don't notice because she leaves her guests alone but she is available if needed. You can walk to town in about 20 minutes and there are several little parks within walking distance. A nice grocery store is in Hillside about a mile away. We will be back to stay again. The unit is quiet and clean and within walking distance of the Belfry Theatre and Fernwood community. The suite is situated in a lovely yard with lots of birds to observe.